The Scientific Committee on Antarctic Research (SCAR) - an inter-disciplinary scientific body of the International Council of Science (ICSU) - initiates, develops and coordinates high quality, international scientific research in the Antarctic and on the role of the Antarctic region in the Earth system. SCAR also provides objective and independent scientific advice to the Antarctic Treaty System Consultative Parties and other organizations on issues of science and conservation affecting the management of Antarctica and the Southern Ocean. In support of this dual mission, SCAR has been developing capacity for international data management amongst its member nations since 1992. In order to effectively implement programs, policies and procedures, and activities to fulfil these roles, SCAR must clearly map out a Data and Information Management Strategy for the future. This document is the next logical step in this process. 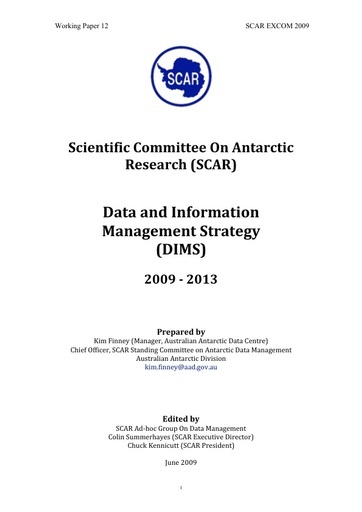 The committee in SCAR responsible for all aspects of data and information management is the Standing Committee on Antarctic Data management (SCADM). Data and information are valuable and irreplaceable resources. In the pursuit of many science objectives (especially those of a pan-Antarctic nature) it is necessary to use data and information collected by scientists from many countries. SCAR recognizes the critical and essential importance of the stewardship of data and information within national and international programs and of its accessibility by the international Antarctic scientific community. This management is not an “add-on” or an additional task. It is a fundamental aspect of modern earth system science and essential to addressing complex questions about how our planet works and how it will respond in the future. Policy, Leadership, Coordination and Governance: better articulated governance arrangements and strong leadership, suitable for driving the development of a distributed, but loosely federated, shared infrastructure. This requires development of a SCAR Data Policy that stipulates the norms that SCAR members should adopt with respect to data sharing and access; data management planning; and establishment of National Antarctic Data Centres (NADCs). Recognising that dedicated leadership is essential for driving development of any shared infrastructure, SCAR members should consider seconding appropriately trained professionals to the SCAR Secretariat and/or assist with raising external funds to support infrastructure development positions. To strengthen existing components of the ADMS, opportunities for partnering arrangements should be explored between SCAR data management groups and those institutions involved in the reformation of the Intergovernmental Oceanographic Data Exchange (IODE) and ICSU World Data Centre Systems. If the ADMS ultimately expands more through partnerships with these types of global systems than through an expansion of the SCAR NADC network, it may then be prudent to review the role, membership and function of SCADM. Cultural Change and Incentives: fostering a culture willing to share and collaborate on data management related activities. Data sharing between SCAR scientists is highly patchy both within and between member countries. Data citation systems are being touted as a mechanism to foster improved data sharing practices between scientists. The Scientific Committee on Oceanic Research (SCOR) has been trialling approaches to data citation. SCAR could formally partner with SCOR in piloting such a system within its NADCs. More could also be done to build an ADMS and to change cultural practices if SCAR’s peak data groups harnessed their collective capabilities to garner funding from external sources. Additionally, more money would be available for scientific data management if SCAR educated funding sources about the need for data management to be an explicitly funded component of supported projects. Leveraging Resources and Systems: leveraging existing SCAR and non-SCAR systems, capabilities and resources and supplementing these where there are obvious deficiencies (the primary purpose of such leveraging is to create a network of designated permanent data archives capable of the long-term management and publication of all types of SCAR related data). The number of NADCs is low relative to the number of national SCAR Members. Of the NADCs that do exist, only a few have significant capabilities. A functional ADMS will be difficult to develop solely through an expansion of the NADC network. SCAR should identify a small number of existing and complementary data access networks with which to affiliate and then promote NADC involvement in these networks. By “affiliating”, rather than building from scratch, SCAR can expand its ADMS at minimal cost and at the same time achieve greater interoperability with other networks. It is also important that SCAR’s peak data management groups (ie. SCADM and the Standing Committee on Antarctic Geographic Information - SCAGI) work more closely together in pursuing common goals. Now that the distinction between managing and publishing spatial and non-spatial data is disappearing, consideration might be given in the future to amalgamating SCADM and SCAGI. Standards and Interoperability: agreement on, and implementation of, standards that support the interoperation of technology platforms and data transport protocols. In particular, development or adoption of standards to describe and encode data objects, equipment, processing techniques and instruments that ultimately function to permit data integration and aggregation. A key component of the ADMS is the Antarctic Master Directory (AMD) metadata system. It is therefore crucial that SCAR works closely with the AMD host organisation (i.e. the GCMD) to help determine the functionality of future iterations of this technology platform. Equally important is the need to recognise that SCAR science covers highly diverse data types and data management requirements. The ADMS must be geared to meeting this diversity of needs. To achieve this goal, further enhancement of the ADMS should be under-pinned by developing an implementation roadmap. Outreach and Guidance: education, outreach and guidance on all facets of the systems operation, protocols and functions. Growing the number of NADCs and improving the capabilities of those that exist could be achieved using a more formalised training and mentoring campaign. Both SCADM and SCAGI should improve their communication mechanisms and mediums. Much of the data management that currently occurs within SCAR science projects is conducted under circumstances outside of the influence of either of SCAR’s peak data management coordinating groups. The network of NADCs on which the SCAR ADMS should be founded therefore needs to be expanded and become interdependent with other, successful thematic and global data networks, that are currently being patronised by SCAR research programs or which have the potential to add value to SCAR science. Several opportunities exist to more closely align SCAR data management with large international data management facilities and networks (notably the ICSU WDCs, IODE, the WMO Information System [WIS], the IPY Data and Information Service [IPYDIS] and the Polar Information Commons[PIC] initiative), all of which conversely need to align themselves with scientific data sources (such as SCAR). To realise its strategic data management vision SCAR needs to develop a roadmap to action recommendations in this report in the form of a Data and Information Strategy Implementation Plan.